The Douglas XB-43 Jetmaster was an American 1940s jet-powered prototype bomber aircraft. The XB-43 was a development of the XB-42, replacing the piston engines of the XB-42 with two General Electric J35 engines of 4,000 lbf (17.8 kN) thrust each. Despite being the first American jet bomber to fly, it suffered stability issues and the design did not enter production. United States Army Air Forces (USAAF) leaders in the Air Materiel Command began to consider the possibilities of jet-propelled bombers as far back as October 1943. At that time, Douglas Aircraft was just beginning to design a promising twin-engine bomber designated the XB-42. Reciprocating engines powered this aircraft but they were buried in the fuselage, leaving the laminar-airfoil wing clean of any drag-inducing pylon mounts or engine cowlings. The airframe appeared ideally suited to test turbojet propulsion. Douglas confirmed the feasibility of the concept and the USAAF amended the XB-42 contract in March 1944 to include the development of two turbojet-powered XB-43 prototypes, reduced from an initial order of 13 test aircraft. The Douglas design team convinced the Army that modifying the XB-42 static test airframe into the first XB-43 was a relatively straightforward process that would save time and money compared to developing a brand new design. Douglas replaced the two Allison V-1710 engines with a pair of General Electric (GE) J35 turbojets, then cut two air intakes into each side of the fuselage, aft of the pressurized cockpit. Removing the propellers and drive shafts freed enough space for two long jet exhaust ducts. Without the propellers, there was no chance of striking the blade tips on the runway, so the bottom section of the vertical fin was also removed. Douglas compensated for the loss of yaw stability by enlarging the upper vertical fin. Douglas Aircraft was keen to mass produce the new bomber and the USAAF considered ordering 50. The company was poised to roll out as many as 200 B-43s per month in two versions: a bomber equipped with a clear plastic nose for the bombardier, and an attack aircraft without the clear nose and bombing station but carrying 16 forward-firing .50 in (12.7 mm) machine guns and 36 5 in (127 mm) rockets. Nothing came of these plans. The USAAF was already moving ahead with a new bomber, the North American XB-45 Tornado, designed from the outset for turbojet power and promising a quantum leap in every category of performance. As Douglas predicted, the work itself was not overly complex but almost two years were required to ready the aircraft for flight due to delays in obtaining the J35 powerplants. The end of World War II caused a general slowdown within the aviation industry and GE was late delivering the engines. When they were at last installed and tested on the ground, one of the units failed catastrophically. Compressor blades exploded through the engine casing, damaging the surrounding airframe and injuring a ground technician. Another seven-month delay ensued for repairs. 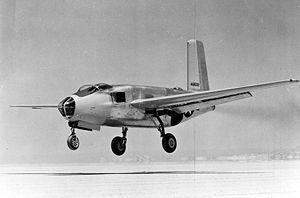 America's first turbojet bomber finally flew from Muroc Army Air Base on 17 May 1946, piloted by Douglas test pilot, Bob Brush, accompanied by engineer Russell Thaw. Caught in a momentous technological shift, the XB-43 contributed to developing procedures for flying the new jet bombers, and it gave yeoman service testing new turbojet engines. Douglas completed the second prototype, AAF serial number 44-61509, flying on 15 May 1947 and delivered it to Muroc Air Force Base, California, in April 1948. The USAAF soon replaced one J35 turbojet engine with a General Electric J47. Douglas delivered the second prototype, designated YB-43, in April 1948. That aircraft was nicknamed Versatile II by USAAF personnel. When the clear plastic nose began to crack from variations in temperature at high and low altitudes, mechanics fashioned a more durable replacement made from plywood. To keep it flying, the US Air Force cannibalized parts from the first XB-43 after it was damaged in February 1951. Versatile II flew more than 300 hours until its retirement in December 1953. The US Air Force only considered the first prototype to fall under the XB-43 designation. The second prototype, though functionally identical to the first, was designated YB-43, consistent with its status as a follow-on prototype under the Army's designation system for aircraft. At one point, the aircraft may have also been designated as "attack" aircraft, A-43, not to be confused with the Curtis XP-87, a project which started as an attack aircraft under the same designation. The A-43 was to have eight machine guns in a solid nose replacing the bombadier's position. The YB-43 was turned over to the Smithsonian Institution in 1954. It was stored while awaiting restoration at the Smithsonian's Paul Garber Facility (National Air and Space Museum) in Suitland, Maryland. In late 2010 it was transferred, along with the sole surviving Douglas XB-42 Mixmaster, to the National Museum of the United States Air Force in Dayton, Ohio. Currently, both aircraft are awaiting restoration in the Museum's Restoration Hangars. Once restored they will be displayed in the Museum's Experimental Aircraft Hangar. 2 x� 0.50 in (12.7 mm) machine guns in a remotely operated tail mount, never installed. O'Leary, Michael, ed. "America's First Jet Bomber" America's Forgotten Wings, Volume 1, 1994, pp. 66-75.